Ninja movie covers blog. Godfrey Ho films mostly. Hi there, Kitaro! That's a very good page you made, and those rarity movies are really cool! One of this movies i saw in my childhood, it was Ninja Terminator :)(thank you very much for uploading those at YouTube). I want to ask you one thing: could you please share with me some movies i can't find anywhere? Oh, please. 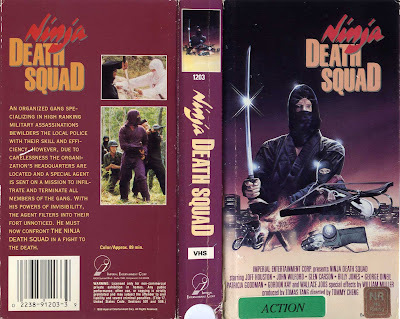 I want "Ninja Death Squad" and "Ninja Masters of Death". Could you please upload those for me somewhere? Sorry for writing here, i didn't found any other way to contact with you. Write me please at Pudentane@gmail.com, or in ICQ: 261745210. Thank you very much.